Take a break from the city and head to Bodega Head and Henry Cowell Redwoods State Park. You'll discover tucked-away gems like Big Basin Redwoods State Park and Mori Point. Venture out of the city with trips to Sonoma Valley (in Sonoma) and Shark Fin Cove (in Davenport). The adventure continues: examine the collection at Cable Car Museum. For other places to visit, maps, photos, and tourist information, refer to the San Francisco trip planner . Zurich, Switzerland to San Francisco is an approximately 14-hour flight. You can also do a combination of train and flight. The time zone changes from Central European Time (CET) to Pacific Standard Time (PST), which is usually a -9 hour difference. When traveling from Zurich in July, plan for little chillier days and about the same nights in San Francisco: temperatures range from 26°C by day to 16°C at night. You'll have a few hours on the 9th (Tue) to wrap things up before traveling to Yosemite National Park. On the 9th (Tue), don't miss a visit to Pothole Dome. To see more things to do, maps, ratings, and more tourist information, read our Yosemite National Park online trip builder . Getting from San Francisco to Yosemite National Park by car takes about 4 hours. Other options: do a combination of flight and car; or do a combination of flight and bus. Traveling from San Francisco in July, you will find days in Yosemite National Park are a bit warmer (33°C), and nights are a bit cooler (9°C). Finish your sightseeing early on the 10th (Wed) so you can travel to Denver. Yucca Valley is an incorporated town in San Bernardino County, California, United States. On the 11th (Thu), see the interesting displays at Hi-Desert Nature Museum, then examine the collection at The Dream Wanderer, and then trot along with a tour on horseback. For where to stay, other places to visit, more things to do, and other tourist information, go to the Yucca Valley trip site . 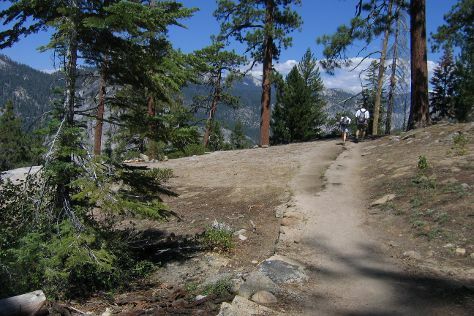 Explore your travel options from Yosemite National Park to Yucca Valley with the Route module. When traveling from Yosemite National Park in July, plan for somewhat warmer days and much hotter nights in Yucca Valley: temperatures range from 46°C by day to 30°C at night. Wrap up your sightseeing on the 11th (Thu) early enough to drive to Joshua Tree National Park. Kick off your visit on the 12th (Fri): hike along Ladder Canyon Trail and then admire nature's extreme beauty at Cottonwood Spring Oasis. On the 13th (Sat), you'll have a packed day of sightseeing: take a memorable drive along Geology Tour Road and then trek along Split Rock. To see reviews, other places to visit, traveler tips, and more tourist information, go to the Joshua Tree National Park driving holiday planner . Traveling by car from Yucca Valley to Joshua Tree National Park takes 1.5 hours. Expect a daytime high around 46°C in July, and nighttime lows around 30°C. Cap off your sightseeing on the 13th (Sat) early enough to go by car to Grand Canyon National Park. You'll discover tucked-away gems like Vermillion Cliffs Scenic Highway and Lookout Studio. Get outdoors at Shoshone Point and Navajo Bridge. 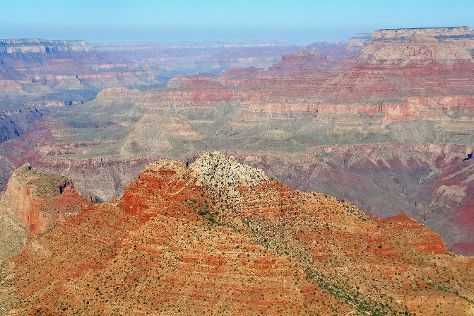 Next up on the itinerary: get great views at Mohave Point, make a trip to Powell Point, take in breathtaking views at Yavapai Point, and take a memorable drive along East Rim Drive. To find reviews, more things to do, ratings, and tourist information, you can read our Grand Canyon National Park trip itinerary builder app . Drive from Joshua Tree National Park to Grand Canyon National Park in 6.5 hours. Traveling from Joshua Tree National Park to Grand Canyon National Park, you'll lose 1 hour due to the time zone difference. Traveling from Joshua Tree National Park in July, expect nights in Grand Canyon National Park to be colder, around 13°C, while days are a bit cooler, around 34°C. Cap off your sightseeing on the 18th (Thu) early enough to travel to Moose. Moose is an unincorporated community in Teton County, Wyoming, United States, in the Jackson Hole valley. On the 18th (Thu), identify plant and animal life at Blacktail Ponds Overlook, tour the pleasant surroundings at Menor's Ferry Historical Trail, and then take in the dramatic natural features at Glacier View Turnout. On the next day, explore the stunning scenery at Cascade Canyon, then take in the dramatic scenery at Hidden Falls, then explore the activities along Snake River, and finally take in the views from Snake River Bridge. For photos, maps, where to stay, and more tourist information, read Moose day trip app . Traveling by car from Grand Canyon National Park to Moose takes 13.5 hours. Alternatively, you can fly. Traveling from Grand Canyon National Park in July, expect Moose to be slightly colder, temps between 30°C and 7°C. Wrap up your sightseeing by early afternoon on the 20th (Sat) to allow enough time to drive to Yellowstone National Park. Get in touch with nature at West Thumb Geyser Basin and Castle Geyser. Next up on the itinerary: look for all kinds of wild species at Gibbon Falls, explore the wealth of natural beauty at Artists’ Paintpots, contemplate the geological forces at Mud Volcano, and cruise along Firehole Canyon Drive. To see photos, where to stay, and more tourist information, go to the Yellowstone National Park trip planning website . Traveling by car from Moose to Yellowstone National Park takes 2 hours. Expect a bit cooler temperatures when traveling from Moose in July; daily highs in Yellowstone National Park reach 26°C and lows reach 4°C. On the 23rd (Tue), wrap the sightseeing up by early afternoon so you can travel to Denver. To see more things to do, other places to visit, photos, and more tourist information, go to the Denver attractions planner. You can do a combination of car and flight from Yellowstone National Park to Denver in 5 hours. Other options are to do a combination of car, shuttle, and flight; or drive. Traveling from Yellowstone National Park in July, you will find days in Denver are a bit warmer (36°C), and nights are warmer (18°C). You will leave for Chicago on the 24th (Wed). Step out of the city life by going to Van Buren State Park and Taltree Arboretum and Gardens. You'll explore the less-touristy side of things at Fernwood Botanical Garden and Nature Preserve and Museum of the Gilding Arts. You'll find plenty of places to visit near Chicago: Chapel of the Resurrection (in Valparaiso), Grotto of Our Lady Lourdes (in South Bend) and Whirlpool Compass Fountain (in Saint Joseph). The adventure continues: kick back and relax at Weko Park and see the interesting displays at Pontiac-Oakland Automobile Museum. To see photos, other places to visit, more things to do, and tourist information, you can read our Chicago trip itinerary maker site . You can fly from Denver to Chicago in 5 hours. Other options are to do a combination of bus and flight; or drive. Traveling from Denver to Chicago, you'll lose 1 hour due to the time zone difference. Expect a bit warmer evenings in Chicago when traveling from Denver in July, with lows around 22°C. Cap off your sightseeing on the 27th (Sat) early enough to travel back home.